St. Patrick’s Day could be summed up as such for me: finding new and interesting ways of using Guinness in the kitchen. (I posted this without the knowledge that Guinness is not, in fact, vegan (thank you, Romina!) For more on this, please read the comments for this post … and, for you vegans, here is a link to a list of vegan beers to help you find an alternative to Guinness) For the last couple of years I’ve rested on the laurels of Guinness Chocolate Cupcakes, which probably would have made yet another appearance this year had I not still been in sugar overload recovery from Dan’s birthday a week ago. 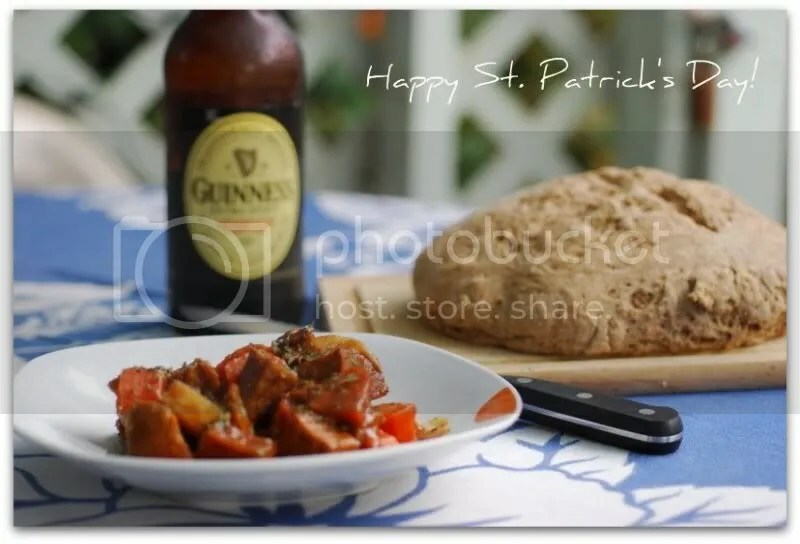 This year I decided that I wanted to make something more savory, so I researched different traditional Irish entrees and quickly came to realize that the culinary influences from the Emerald Isle have not made their way into my cooking. Colcannon, corned beef and cabbage, corned beef hash, and even shepherd’s pie are all strangers to my kitchen. 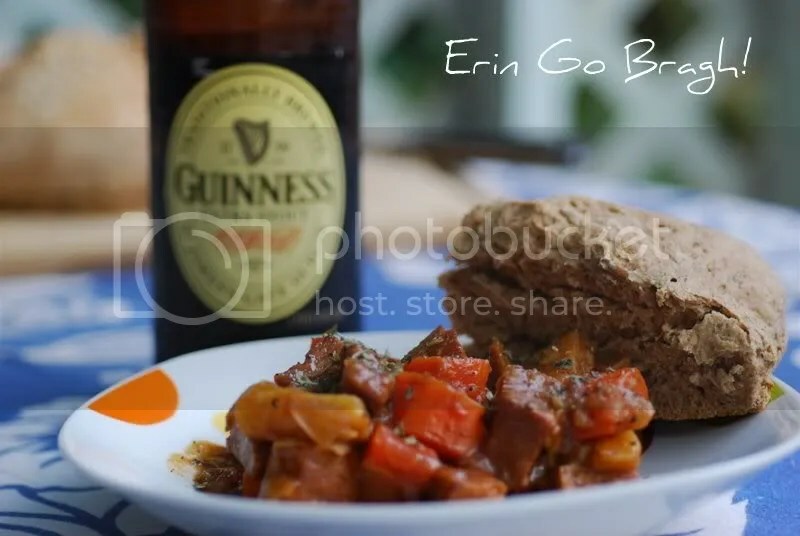 After careful consideration, I finally settled upon a Guinness and beef stew recipe from the Food Network and a brown Irish soda bread recipe from Cooking Light to veganize (the shepherd’s pie will just have to wait). Below I have copied the recipes directly from their origins and edited them to reflect my adaptations. These two recipes make a wonderful and satisfying dinner for any night, not just St. Patty’s Day, so eat up! 1. Toss the seitan with ½ tablespoon of the oil. In a small bowl, season the flour with salt, pepper, and cayenne. Toss the seitan with the seasoned flour. 2. Heat the remaining 1 tablespoon of oil in a Dutch oven over high heat. Brown the seitan for five minutes. Reduce the heat, add the onions, crushed garlic and tomato paste mixture to the pot, cover, and cook gently for 5 minutes. 3. Pour the Guinness into the pot. Bring the Guinness to a boil, then add the carrots, potatoes, and thyme leaves. Stir and adjust seasonings. 4. Cover the pot and simmer over low heat for 1 ½ hours. Garnish with parsley and serve. 1 1/4 cups soymilk, mixed with 1 ¼ tbsp apple cider vinegar1. Preheat oven to 350°. Mix the vinegar with the soymilk and set aside. Lightly spoon flours into a dry measuring cup; level with a knife. Combine whole wheat flour and next 6 ingredients (whole wheat flour through salt) in a large bowl; cut in Earth Balance butter with a pastry blender or 2 knives. Make a well in center of flour mixture; add the soymilk mixture. Stir just until moist.2. Turn dough out onto a lightly floured surface; knead lightly 5 or 6 times. Pat dough into an 8-inch circle on a baking sheet lightly coated with cooking spray. Using a sharp knife, score dough by making 2 lengthwise cuts 1/4 inch deep across the top of the loaf to form an X. Bake at 350° for 35 minutes or until a wooden pick inserted in center comes out clean. Cool on a wire rack. Cut into 12 wedges. This looks super yummy but Guinness is unfortunately not vegan. =( Do you know of any alternatives to Guinness? “In the UK beer (bitter) is also commonly fined using isinglass. Many bottled bitters and most lagers are vegan. Guinness is not suitable for vegans.” Isinglass is made from the swim bladders of fish. Vegan Connection also maintains a list of vegan beers so that when you make this, you can be a lot more mindful about your ingredients than I was.